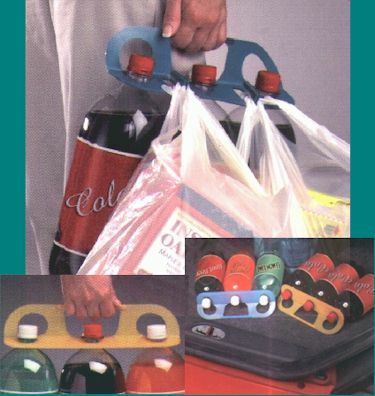 Bottle & Bag Carrier; Kitchen products, kitchen utensils, to make life safer. Carrying those heavy plastic shopping bags are murder on your hands. If you have to carry them any distance they start to dig in and can be very painful. Now you can comfortably carry bags and bottles with greater ease. Easy to use. Each Carrier holds 3 bottles from .0 to 2 liters. Hang 2, 3 or even 4 plastic bags on the hooks. Also great to keep bottles from rolling around in the trunk. A must for every shopper. Comes in various colors but we cannot allow color choices, sorry. Great for the elderly.